One of the big advances in TV news over the past year has been the growth of what's called citizen journalism - people sending in photos and video from their mobile phones. It's still early days, but some observers think this development could radically change the way news is brought to our screens. 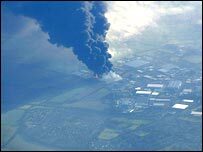 For instance, the recent fire at the Buncefield oil depot in Hertfordshire marked another step in the fast-changing relationship between broadcasters and their audience. The first pictures of the inferno - shown on Sky News - were sent in by a viewer. And the BBC received a record 6,500 images in the wake of the incident. So if the London bombings of 7 July - after which hundreds of people sent pictures to news organisations - caught broadcasters slightly off guard, since then they've been waiting with open arms for the next influx of "user generated content". In fact, the UK has largely been at the vanguard of this development, which is down to the huge spread of mobile phones with camera and video capability. One survey put mobile penetration in the UK at 101%! But it's also about how we use those phones. "In the United States, it's all very new to them - they've only really just got texts under control," explained Alfie Dennen of moblog.co.uk, where people can post their phone pictures. "Here we're a lot more technologically aware, we've been using the technology for a long time." Of course, using material sent in by members of the public brings new dilemmas for broadcasters. Is it authentic? Who owns the copyright? Was privacy infringed when the pictures were taken? How much should TV networks be paying for material - or should they pay at all? 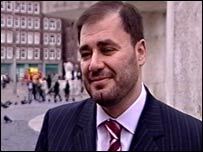 "The genie is out of the bottle and it's not going to get back in," said Richard Sambrook, the BBC's head of global news. "The role news organisations play will change. Broadcasters have to think very hard and very clearly about what value they can bring to this new environment." But if the UK is perhaps ahead in setting up ways to harness this new source material, it's certainly not the only country whose broadcasters are using it. The head of CNN International, Chris Cramer, told me one of his correspondents had no sooner arrived in Pakistan after the earthquake there than someone thrust into his hand phone footage of a block of flats collapsing. It went straight on air. "Broadcasters - if they're bright - are now realising that they need to engage with the audience to get this video, to ensure there's a way to get it on air and to provide a landing ground for cellphone video," said Chris Cramer. 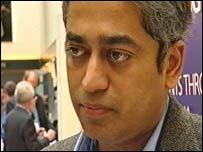 Rajdeep Sardesai, who is setting up a 24 hour news channel in India, believes pictures from the public can often tell a story in a way professional journalists cannot. "A few months ago when Mumbai was flooded out, a number of the pictures came from amateur video and mobile phones," he said. "I think when you have a news event that affects the maximum number of people, a human, natural tragedy like earthquakes, like floods, that is where I believe the concept of citizen journalists will actually work." Broadcasters have not been slow to identify other, more practical, advantages of having an army of potential newsgatherers on their patch. "We cannot be everywhere," said Burcun Imir, deputy head of the Dogan news agency in Turkey. "We have 800 correspondents just in Turkey, but that is not enough. "As soon as people understand that we are journalists, once they see our cameras, they change. So we use sources, that's what journalism is, and this time it's the citizen journalist." 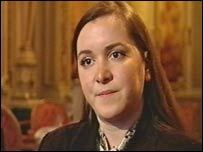 She recounted how secret footage filmed by a worker inside a children's home had led to allegations of torture and a government investigation. Wahad Khanfar, managing director of Al Jazeera, agrees there could be benefits to the citizens themselves as well as to the broadcasters. "In the Middle East, in the Arab world in particular, citizen journalism is a necessity. You are talking about the future that is being shaped, about reform and democracy, about a situation where institutions might not live up to the expectations of the masses. "Now people express their views and have some input. That is a phenomenon we need in the Middle East and must be encouraged." In fact, the issue of opening up the media to a greater range of voices is at the heart of a wider debate about who should be supplying the news itself. 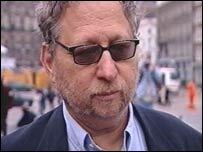 "There is a whole movement out there which is trying to democratise the media," according to Danny Schechter, journalist and author of Death of the Media. "They want something new that connects with their real lives. They want something that reflects their lives and also want to be involved in it." Former US presidential candidate Al Gore is backing Current TV, a satellite and cable channel which lets young viewers create their own news. Rocketboom is another example, a daily videoblog giving a quirky spin on arts and technology news. Broadband technology now means anyone can go online with their own news station. Felixstowe TV, featured on NewsWatch a couple of weeks ago, gets 25,000 visitors a month - not bad when you consider the Suffolk town's population is 40,000. Founder Chris Gosling thinks the station fills a gap in the market. "Local people like to see local life," he said. "They want to see Charlie Brown from down the street, they want to see their local councillor, they want to see people who they genuinely relate to rather than, let's say, Tony Blair." Danny Schechter welcomes this growth of an independent media, with a different take on established values. "The old media is dying but I don't lament that death," he said. "I see something new emerging. We have 10 million bloggers, people who want to participate and take pictures and make film and that's the future." Clearly, established broadcasters are facing some difficult challenges. They're having to redefine the relationship they have with their audience, but also to recognise that the viewers could easily end up becoming a form of competition. For Al Jazeera's Wahad Khanfar, it's an issue that can't be avoided. "We might lose some control but it is for the good of humanity so we must go for it," he said. 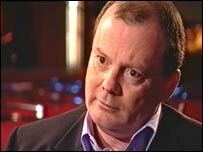 "I think we're at the very beginning of quite a long journey," agreed the BBC's Richard Sambrook. "It's going to take us to an entirely new place. "It's too early to tell exactly where we're going to end up but there's a fundamental realignment going on - we don't own the news anymore." Have You Got News For Us? can be seen on BBC News 24 on 24 December at 1930 GMT, on 31 December at 0630 and 1330 GMT and 1 January at 0130 GMT.